As a non-profit organization that exists solely through donations, fundraising is an important part of the library’s activities. On Friday, March 11th, HB board members, staff and volunteers put on a silent art auction at the Lol-Ha Snack Bar during happy hour. Featured items included 3 paintings by Oscar Romero, a Chicago-based artist who spends part of the year in Akumal, a painting by local artist Sergio Gamboa (proprietor of Boonil Naj in Akumal), and earrings by local jewelry maker Margarita Herrera Erosa (proprietor of Nak’az Nah in North Akumal). The auction included a number of handcrafted objects from Oaxaca including: hand-painted bookmarks & letter openers, hand woven bags, a hand painted wooden animal and some black pottery earrings. 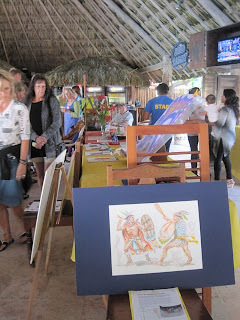 All together the art pieces showcased a nice variety of Mexican arts, both traditional and contemporary ones! The auction was a great success, raising around $1000 US in bids and donations. About 25 people bid on items, and many others came over to learn what was going on, read some information about the objects on auction and make donations to the library. 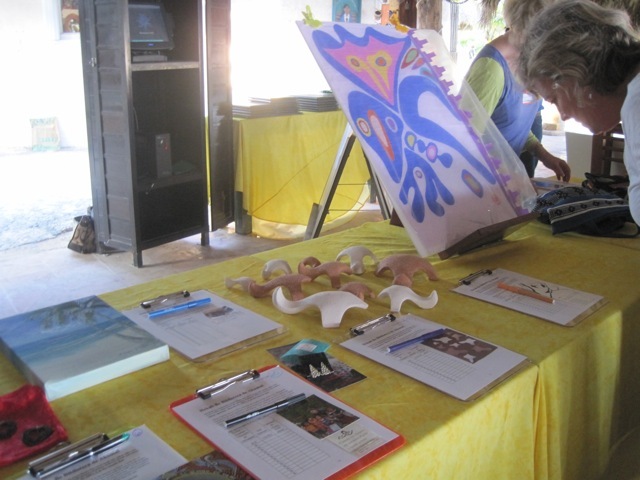 We were especially pleased to have some winning bidders from among local area residents who took home some special art pieces to adorn their residences here in Akumal! The auction also brought out a lot of volunteer helpers, both locals and visitors, who made it all possible. Special thanks to Laura and David Wolfe for letting us use the space in the Snack Bar to host the event! 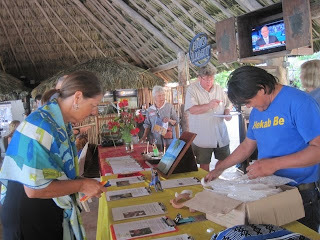 We would like to thank the people who donated items for the auction: Oscar Romero, Debby & Bruce Oakley, Sergio Gamboa, Arq. Margarita Herrera Erosa, Gerardo Perea Herrera and Diane Buchanan. We would also like to thank the volunteers before & during the auction: Debby & Bruce Oakley, Yilin Zhang, Charlene, Julie Brenton, Carol Current, Emilia May, Carlos Canul, Nancy Welch, Gary Schiender, Ellie Zucker and Diana Kiel Wornson.